Visitors to Spain and Portugal often want to visit both countries' capitals and take the train or fly from Madrid to Lisbon. 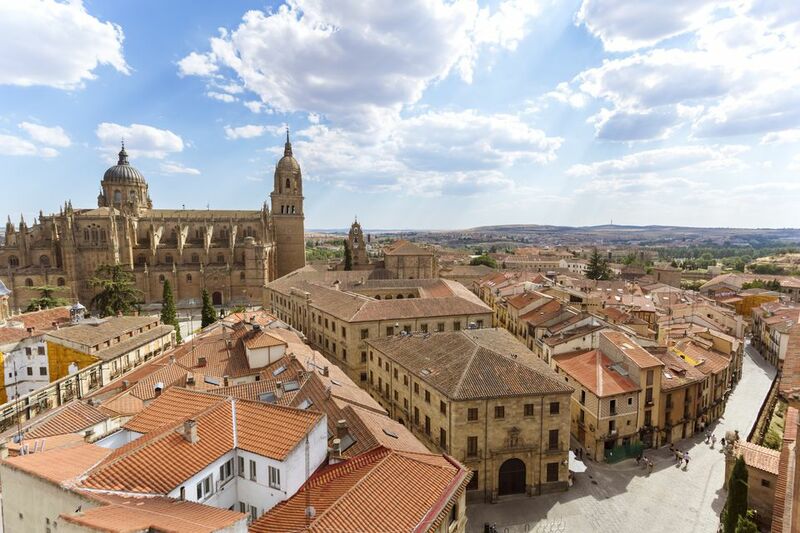 But the savvy traveler doesn't race from major city to major city instead of visiting smaller places along the way, such as Salamanca, Spain. Visit Salamanca for Spain's most beautiful plaza, its Plaza Mayor, and for some of the best tapas bars in the country. It's also easy to get from Salamanca to Madrid. Salamanca is just 62 miles from the Portuguese border, making it seem like an ideal final stop in Spain before heading to Portugal. Salamanca is closer to Porto than Lisbon, so you would think that it would be easier to get from Salamanca to Porto than to Lisbon, but that's not necessarily the case. First, the bad news: None of the means of transport is ideal. The problem is that while Porto is closer to Salamanca than Lisbon is, there is no train. But the only train to Lisbon is a night train, while the return journey from Lisbon to Salamanca arrives in Salamanca at the awkward time of 5 a.m. So you have the choice between the uncomfortable bus to Porto or the more expensive night train to Lisbon. Hotels typically won't accept you at five in the morning, so you may not want to take the train into Salamanca. Madrid to Salamanca by bus or train. There are buses and trains throughout the day, taking an hour and a half to two hours and 45 minutes. Salamanca to Porto by bus. One bus per day, in the afternoon, takes six hours. Porto to Lisbon by train (perhaps via Coimbra). There are trains throughout the day, taking about three hours. Lisbon to Madrid by train. There is one train per day, and it's a night train. With such long train journeys, you might want to get a rail pass. Take a train from Lisbon to Coimbra to explore Portugal's historic university city. Coimbra is also a good place for people traveling from Porto to head to Spain because there are good transport connections from Porto to Coimbra. To get from Coimbra to Salamanca, you're better off taking the bus since the train drops you off at an unusual hour. If you do want to take the train, note that trains depart from Coimbra-B, which some websites don't recognize as the same city as Coimbra, even though it is. An interesting long way around is to head south from Salamanca, via the Roman ruins of Merida (and maybe the UNESCO Heritage site that is the old city of Caceres). There are buses to both, taking between four and five hours to reach Merida. From Merida, there are buses to Lisbon and Evora, in the wine-producing Alentejo region. The bus from Lisbon to Salamanca is run by ALSA. It takes about 10 hours, but it's cheap. The advantage of the bus over the train is that you arrive in Salamanca at a more sensible hour (early evening, usually). The bus from Porto to Salamanca is also run by ALSA. The journey takes between five and seven hours and is also cheap. If you like to drive in Europe, you have the option of skipping all the transportation complication of this itinerary and just hitting the road. The 310-mile drive takes about 5.5 hours. Take the A1, A23, A25, and A-62. Some of these are toll roads. The 217-mile drive from Salamanca to Porto takes about 3.5 hours. Take the A25 and A-62 roads (these are both toll roads).